The sisters who stole everyone's heart! Just in the past year, the name Elsa has jumped to the Top 100 Female Baby Names List for the very first time... And we all know what made this beautiful so popular... Disney's Frozen! The sisters, Elsa and Anna, have taken the world by surprise and have quickly became everyone's favorite sisters! From boys to girls - Every child LOVES Disney's Frozen. Barnes and Noble have all kinds of Frozen themed books as well as 17 Nook eBooks, which I've listed below. 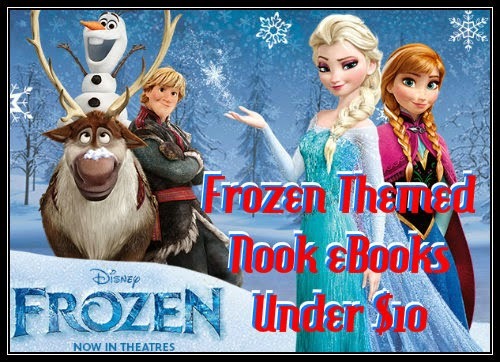 If your child is a Frozen fan then they're sure to love going along on one of the many adventures Elsa and Anna take them when reading one of Disney's Frozen Nook eBooks! Relive Disney’s Frozen with this exciting and visually-stunning graphic novel! Follow along with your favorite characters—Anna, Elsa, Olaf, Sven, and more—as they race to save the kingdom of Arendelle from an eternal winter. Enjoy the adventure from the beginning! Kids will love this full-color storybook that features Kristoff and Sven from Disney's Frozen! Anna sets off on an epic journey teaming up with mountain man Kristoff, his loyal reindeer Sven, and a loveable snowman named Olaf to find her sister Elsa, whose icy powers have trapped the kingdom of Arendelle in eternal winter. Based on Disney's Frozen, this four book set tells the story from four persecptives—an easy-to-read book for new readers! Anna and Elsa are preparing for their kingdom’s very first royal ball! Girls ages 3 to 7 will love reading how the royal sisters head outside to find flowers for their party and end up rescuing a baby reindeer—with help from Olaf! This brand-new hardcover storybook stars the characters from the award–winning movie Disney’s Frozen. It makes a perfect holiday gift! Read along with Disney! In Walt Disney Animation Studios’ Frozen, the kingdom of Arendelle is trapped in a never-ending winter! Queen Elsa’s icy powers have accidentally caused this terrible storm. Princess Elsa knows she must find her sister so they can return home and thaw the kingdom. This 2-in-1 book is told from both Anna and Elsa’s perspectives. Follow along with word-for-word narration to find out if together the sisters can save their home. When the kingdom of Arendelle is trapped in an eternal winter, Anna, a fearless optimist, teams up with extreme mountain man Kristoff and his sidekick reindeer Sven on an adventure to find Anna's sister, the Snow Queen Elsa, and put an end to her ice spell. Anna tells the whole adventure in her own words in this illustrated chapter book based on Disney?s Frozen! Read along with Disney! Follow along with word-for-word narration in this early reader based on Disney’s Frozen. Elsa and Anna are the royal sisters of Arendelle. When Elsa becomes queen, she accidentally creates a snowstorm in the entire kingdom! Join the adventure, encounter mystical trolls, meet a funny snowman, and anxiously wait to see if the sisters can save the kingdom in time. Read along with Disney! This fun, early-reader is based on the coolest comedy-adventure ever to hit the big screen: Disney's Frozen. Illustrated in full color, the main characters of Frozen?including Anna, Kristoff, and Olaf?show kids a variety of fun and silly opposites, all taken from the hit film story. Walt Disney Animation Studios’ Frozen is the story of Anna, who sets off on an epic journey to save her kingdom. Teaming up with an adventurer named Kristoff and his reindeer, Sven, Anna searches for her sister, Elsa, whose icy powers have trapped the kingdom in eternal winter. Enjoy this retelling with eight pages of full-color scenes from the film! When the kingdom she loves is trapped in an eternal winter, it is up to Anna and the daring mountain man Kristoff to set out on an adventure filled with danger, magical creatures and a hilarious snowman in order to find her sister, the Snow Queen. Based on the Disney film, Frozen, this enhanced storybook features thrilling sound effects, word-for-word narration, and original movie voices! When royal sisters Elsa and Anna fight at Elsa's coronation, the new queen's secret is revealed — she has icy powers that she can't control! Elsa flees to the mountains, not knowing that she has left her kingdom in the grip of a never-ending winter storm. It's up to Anna to track down Elsa and convince her to return and set things to rights. Encountering adventure and magic at every turn, Anna battles the elements in a race to save the kingdom from destruction. Read along with Disney! Based on Disney's Frozen, this charmingly illustrated storybook features everyone's favorite snowman, Olaf. Olaf is a very special snowman — he sings, he dances, and he has big dreams that he loves to share. Follow along with the word-for-word narration and explore Olaf's world! Explore a wintery world of magic in Disney Animation Studio's latest film, Frozen. This beautiful picture book features an original story about Anna and Elsa, the film's two royal sisters, as well as illustrations by one of the artists who worked on the film. It’s Christmas in Arendelle and Anna and Elsa want to make it the best one ever! Find out how the royal sisters from Disney’s award-winning movie Frozen celebrate. Girls ages 4 to 6 will love this Step 2 reader (good for 1st and 2nd graders) that comes with press-out ornaments featuring pictures of the characters, and festive glitter on the cover! Makes the perfect holiday gift for ANY Frozen lover! Anna is a free-spirited daydreamer determined to save her kingdom from eternal winter. Based on Disney's Frozen, these four board books come in a sturdy box with handle so kids ages 2 to 5 can have frosty fun on the go! Enter to Win a Cricut Explore!